This game is mentioned in activity books for both boys and girls. It consists of two pairs of sticks, two wooden hoops, and some ribbons for ornament. The hoop is tossed back and forth on the sticks and, with the ribbons attached, almost looks like a period illustration. To play the game, we recommend starting with just one hoop. 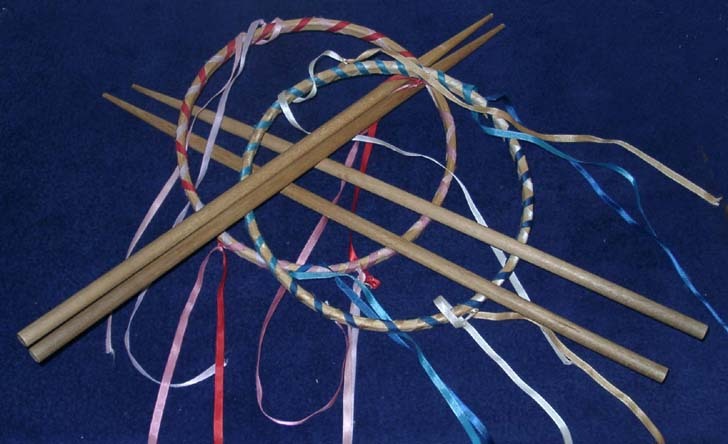 Each player takes two sticks and the person to toss the hoop puts the hoop over both sticks. The sticks are then crossed and, as the sticks are pulled away from each other, the hoop will slide up the sticks. If the sticks are pulled quickly, the hoop will fly off the end of the sticks toward the other player. The other player catches the hoop and tosses it back in the same manner. After both players become skilled, they can each launch a hoop simultaneously. To avoid collisions in mid-air, the players may want to agree ahead of time which hoop will be tossed high and which will be low. And if you lose a hoop, you can replace it. 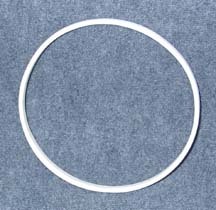 We carry individual hoops but you need to supply your own ribbons.